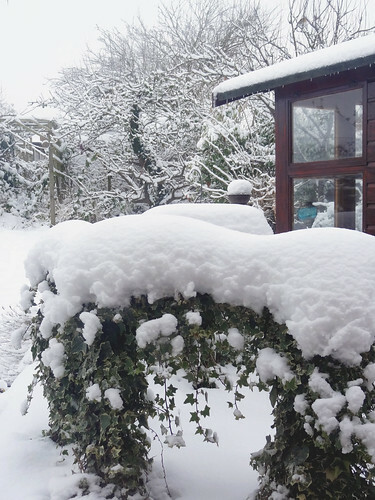 It seems all the UK blogs are full of posts about snow. I have decided to join this bandwagon, because basically I've been trapped in the house by it for over a week now and I'm going stir crazy! Essentially if I'm forced to look at it, then so are you! This is the view from my back door. I took it while stood just inside my back door, cowering against the cold. After admitted that I needed to get outside if I wanted to take decent photos, I went hunting through boxes for my old walking boots and tucked my the legs of my trousers in. I'm glad I did, because that snow is seriously deep! 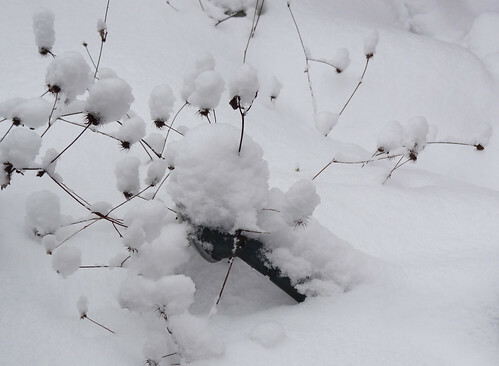 This is the spout of our standard sized watering can, buried in the snow. 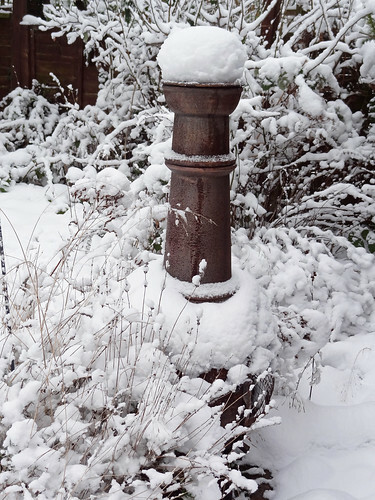 Even our big barrel bellied chiminea is strangely distorted by the snow. Nothing is recognisable. 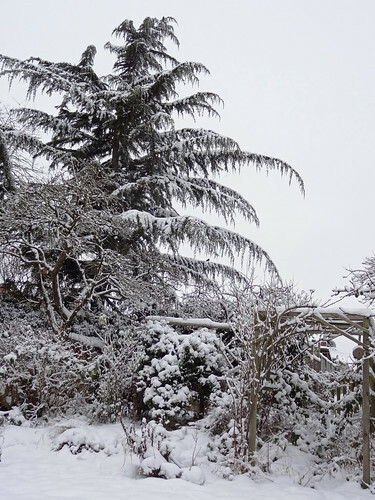 The whole garden looks like an alpine resort. 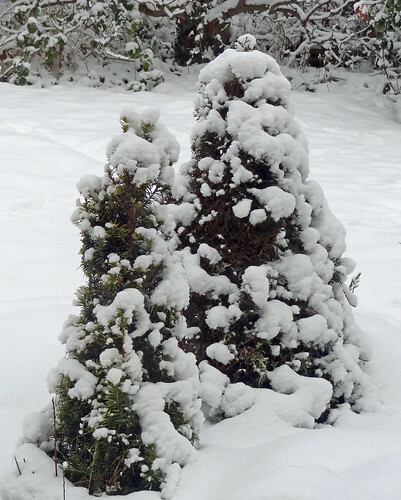 Even the miniature conifers tree look otherworldly. Without something to put their size into context, they could be in a forest of deepest Norway! 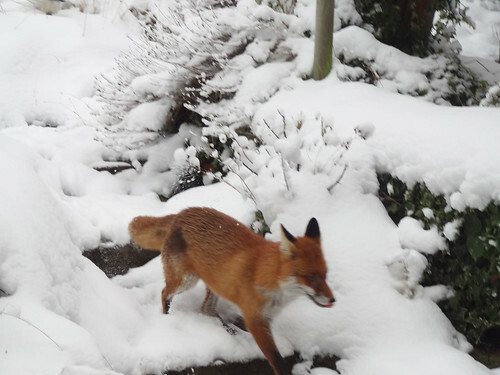 All the snow has meant that the wildlife is easier to see. 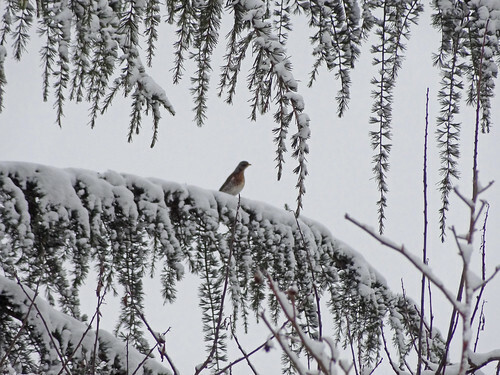 We have so many birds filling the trees right now. I think they were in hiding during the actual snow fall so they are ravenous now. 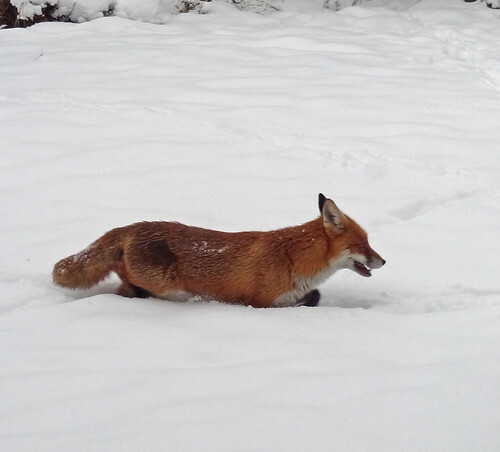 We seem to have acquired a very brave fox. He used to slink around in the dark, at the corners of the garden. Since the snow he's being bold as brass and wading across the grass lawn, that's buried in snow. He's actually rather a handsome beast, so I don't think he's doing too badly by stealing cat food from the local neighbourhood tabbies. In fact he's almost too fast to snap as he rushes down the steps towards the side of the house. I really hope I can get some more photos of this guy in the coming days because he is really beautiful against the snowy backdrop. I'm sure, to all my Canadian and most of my US readers, this UK preoccupation with snow seems a little wimpy. The trouble is, we are so unused to any kind of snow, the country usually just shuts down for a couple of days until it melts. We simply don't have the infrastructure to handle it; we don't have snow tyres, we don't have snow plows and we certainly don't have the practice. It appears that is going to be on the ground much longer than usual this year. It's already been a week and the forecast is for it to still be here on Friday, at least, as the temperature won't get above freezing. My main problem with this weather is that I am trapped. My scooter can't cope with the slippy ground and the gradient of the hill I live on. To be honest it would struggle with the slip on the level, but I'm being kind. I think if the snow carries on much longer I will begin to go stark staring mad! I hope until it melts my crafting will help keep my sanity levels stable. 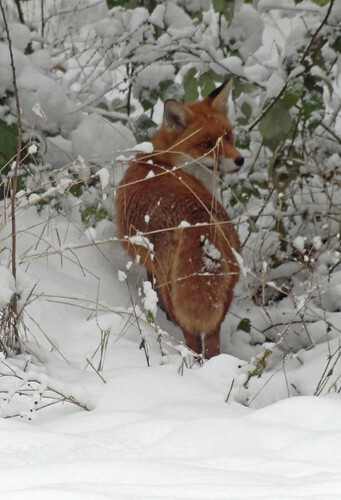 I promise no more snow pictures this week, unless they are wildlife related, because who doesn't like to see snowy animals?